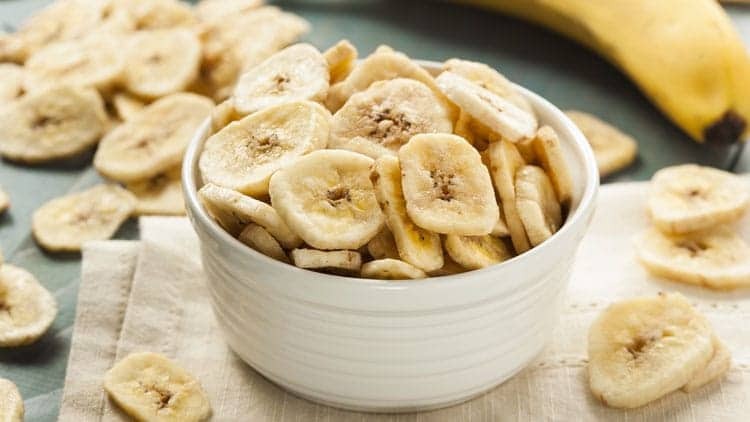 Lately we’ve been craving for deliciously sweet and guilt-free banana chips without the oil laden frying process. Yes, we could easily pick up a bag of chips, but we wanted to eat healthy. Since most store-bought brands of Banana Chips are coated with LOTS of sugar, they’re not the healthiest choice. So we made some Homemade Banana Chips! These can be eaten as snack food or dessert. You can easily make these at home with either a food dehydrator or a low temperature on your oven. Banana is one of the best choices when you need a little energy because it’s quick and easy to digest. But it would be quite messy if you bring bananas with you everywhere right? So to our workout buddies out there, before hitting the gym this is the ideal healthy snack for you since the chips are portable. And because they offer fiber, they’ll make a great snack if you’re watching your weight, too. The chips can also be a good tea time snack. In fact, it can be an anytime snack especially when you’re in the mood to munch on something. You can make these sweet little gems with some quick prep and a few hours in your own kitchen. 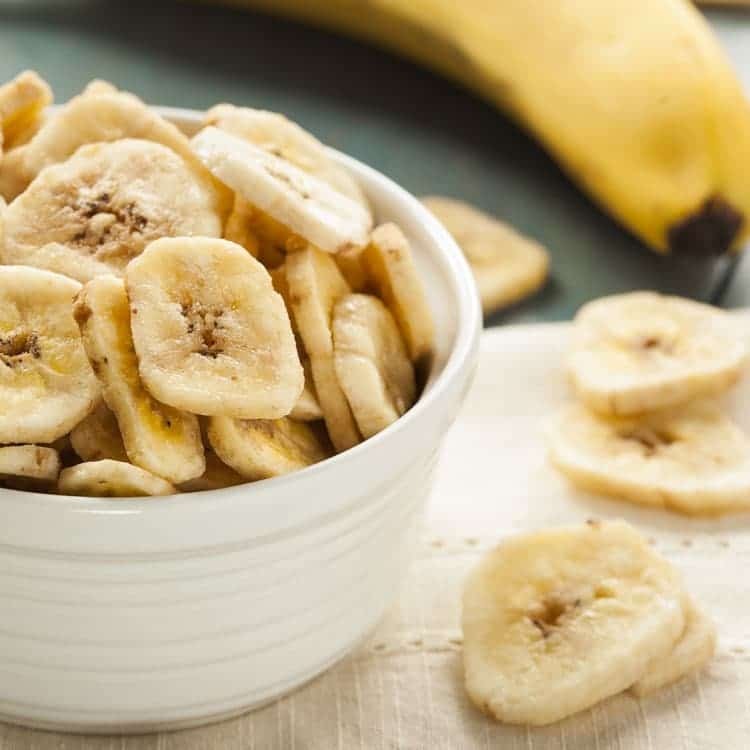 These irresistible hearty banana chips are seasoned with cinnamon to satisfy sugar cravings. It’s okay to devour the entire batch of chips since it has an overly addictive chewiness. But don’t fret, half a batch is under 150 calories. 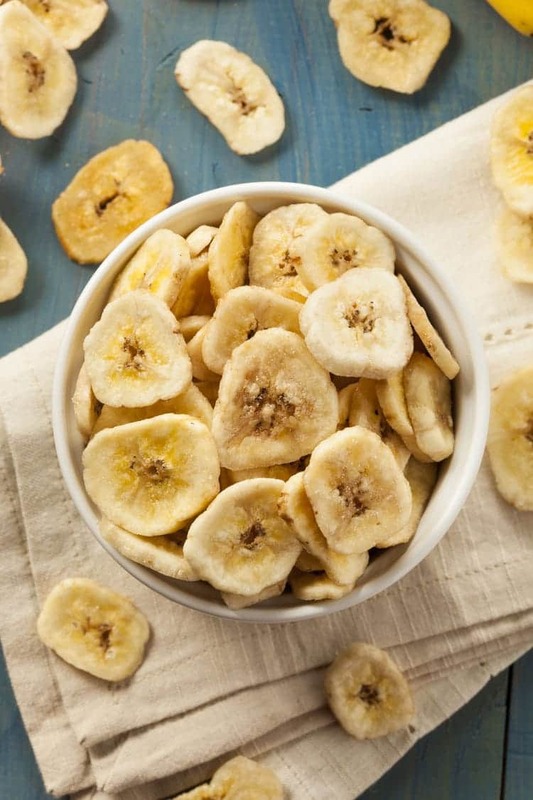 Follow this perfectly crisp and sweet banana chips recipe for an inexpensive, guilt-free snack. If you haven’t noticed, we love guilt free snacks. Not only do we enjoy Fruit Leather and fruit kabobs, but we also can’t get enough of healthier-for-you treats like our Weight Watchers Banana Bread. Peel the bananas and slice them very thin. Brush with lemon juice to prevent excessive browning. Bake at 250F for about 1½ – 2 hours turning half-way through baking time. Alternatively, you could use a dehydrator. Let cool completely before storing. For savory banana chips sprinkle with salt. For a sweeter chip use cinnamon and riper bananas. Peel the bananas and slice them very thin. Brush with lemon juice diluted with water to prevent excessive browning. Bake at 250F (or use a dehydrator) for about 1½ - 2 hours turning half-way through baking time. Let cool completely before storing. When does the water come into play? Dilute the lemon juice with a little bit of water before brushing on the bananas. Does the degree of ripeness matter? Sometimes my grocery bags ripe bananas (yellow with brown flecks) and sells at a discount. I’m not sure of this. I’ve always used yellow bananas and reserve the aging bananas for baking.